All online businesses thrive with traffic. Without traffic, potential clients don’t see your site because its value drops in search-engine rankings. 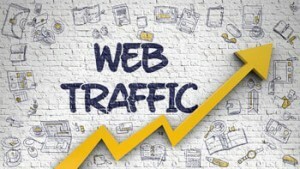 It’s terrible for your business if you don’t get any website traffic. It ’s even more frustrating if you’ve spent a lot of time, money, and effort on making the website look ideal by working with an Atlanta web design firm. Implement the following techniques to drive traffic to your site and increase your reach. Consumers want sites with good content. In the past, sites would simply stuff pages with keywords in an attempt to improve their search engine ranking. Google created new search algorithms to identify quality content compared to something full of keywords that don’t make sense. Google might also penalize your site and lower your search-engine rank. Visitors are more likely to share quality content, increasing the number of backlinks to your site and its search engine ranking. Social media creates an opportunity for you to reach clients directly and drives traffic to your site. The majority of sites with high traffic were linked to an official Facebook page. Establish accounts on Facebook and Twitter, but don’t forget about less common avenues such as Instagram or LinkedIn to share information about your business and increase traffic. Searches on mobile passed the volume of searches on desktops for the first time in May 2015. The trend shows no signs of slowing down, especially with newer phones and tablets having more technology and capabilities. People are more likely to recommend your site if they have a positive mobile experience. The days of cold-calling are in the past, and email is the present and future. Sending promotions and personalized offers to subscribers can boost sales. Automated email marketing tools allow you to draw customers back who added items to their cart but didn’t complete a purchase. Search engine results contribute to your success, but a paid search can deliver quicker. A campaign through a program such as Google Ads can spike your traffic. Use relevant keywords and adjust your pay-per-click advertising program as needed to get the best results. Online businesses struggle in the same way brick, and mortar stores do. Utilize these six strategies to improve your search engine rankings and increase traffic.